If more attention could be paid to the patient, that would be great. I understand he's a doctor and may beon call, but the constant interruptions to answer phone calls takes away from the doctor/patient appointment and relationship. If more attention could be paid to the patient, that would be great. I understand he's a doctor and may be on call, but the constant interruptions to answer phone callstakes away from the doctor/patient appointment and relationship. 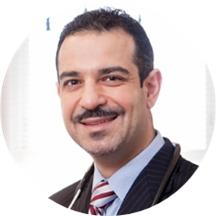 Dr. Fadi El-Atat is an internist and cardiologist treating patients in Montclair and Union, New Jersey, and the surrounding communities. He holds certifications from the American Boards of Internal Medicine, Cardiovascular Diseases, Interventional Cardiology, Nuclear Cardiology,, Vascular Medicine, and Endovascular Medicine. He is also a fellow of the American College of Cardiology and a member of the American Medical Association. For his undergraduate education, Dr. El-Atat attended the American University of Beirut, where he subsequently received his medical degree. He is affiliated with 6 hospitals in New Jersey and with Mount Sinai hospital in New York City. Dr. El-Atat has been in practice for more than 10 years and has become a top doctor in New Jersey. He understands the importance of practicing in internal medicine with high moral values, honesty, and integrity. Patients visiting Dr. El-Atat can receive a full range of general, preventive and cardiological services including echocardiograms, ultrasounds, and CT scans. His staff is extremely thorough and patient. First of all, they are open on Saturdays! Everyone there work together like a well- oiled machine and are well-mannered. They know what they're doing and listen attentively to your concerns, especially Dr. Sarah and Dr. Fadi. I really felt likethe only patient in the room when the were many. Dr. Sarah and Dr. Fadi gave me all their time and attention. Thank you. I will be reviewing again after my follow up in 3 weeks. He was nice but I wasn't pleased with the wait time and the receptionist was brusque, there were a couple of other problems that I won't get into because he was nice. I think the staff that perform the various tests are amazing. They are very personable and made me feel comfortable. When I finally got the chance to meet Dr. Fadi, he was very friendly and made me feel confident that mysymptoms were manageable. The only downside to the visit was the long wait from beginning to end. Overall, good experience. My first time at Dr. Fadi's office was a great experience. I think I have just found a new primary care doctor. All thanks to Zocdoc. More then I expected. the service was beyond my expectation. The staff was very professional and cordial. Dr. Fadi A. Elatat is a phenomenal doctor. He listened and asked excellent questions and was very helpful. My opinion is that Dr. Elatat is the kind of doctor who puts the well-being of his patients above financial gains. I recommendhim highly for his medical skills and for his genuine interest in helping patients get the best care. The doctor is very nice guys & the staff are also very nice. During my visit they wanted to run a bunch of tests without explaining why I needed them. Overall, the visit was fine but the wait was too long. Doctor asked us to come back for a 15 minute appointment but it took over 2 HOURS to even see him for a 2 minute discussion. Absolute waste of time. We will be finding a different doctor in the future. It took about 3yrs to come out of the facility. Doctor hardly had time for the patient.. In mid of discussion he left the room about 6-7 times so i had to repeat few times. Didnt spend much time in discussingtest outcome and suggested me to go through invasive procedure even without looking the echo result or blood test. There hours and 15 minutes after we arrived, we are still here and have not seen the doctor yet so needless to say we are dismayed. I’m writing this review from the doctor’s office still going through the hoops. The office was extremely busy. The doctor was knowledgeable, but barely had the time to sit down and explain my situation. I left with many questions and I was given no time to ask.